Correct Horse Battery Staple... 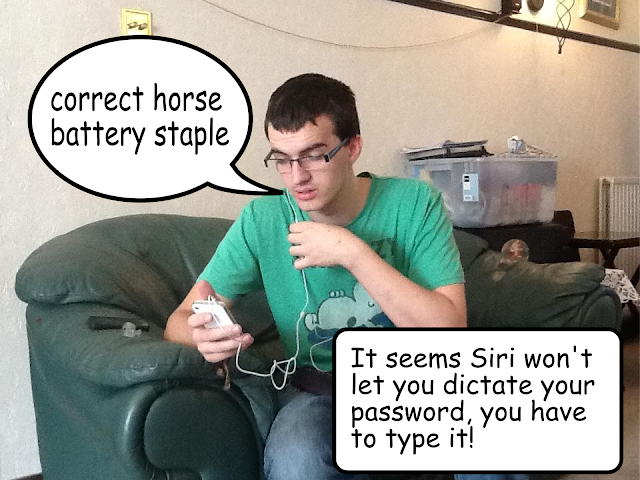 It seems Siri won't let you dictate your password, you have to type it! Looks like a Siri®-sod to me. Whats anonying is I just found out on my new 4S that in the UK Siri is a man. Stranger key on my keyboard! New serious limitation on all BT broadband lines! Are you sure it is Thursday? Are you sure it is Wednesday? Syncing my life to the cloud? You can sort our internet out, right? Is this a good look for me?